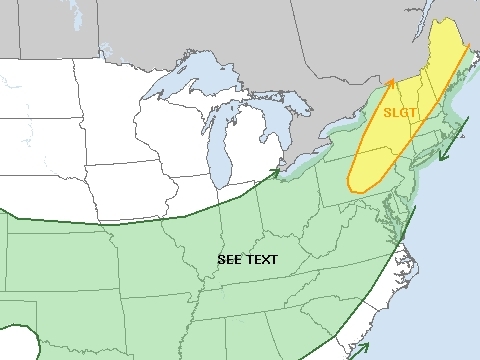 The Storm Prediction Center has a slight risk of severe weather out for tomorrow across Central into Northeastern Pennsylvania on northeast into New England, in association with an advancing cold front that will put an end to our summer fling in September. While severe storms may have a better chance of organizing to our north and west, the region does run the risk of seeing some storms fire up during the afternoon and evening hours. Those storms could produce localized downpours and heavy rainfall -- PWAT's around the region approach 2.00" and parameters for thunderstorm development are pretty solid. Getting them to severe may be another matter as some of the instability parameters like lift are marginal locally. High resolution NAM graphic for 5 PM Thursday. At minimum, gusty winds can't be ruled out in any thunderstorm that does develop. On Thursday, it appears for us we see scattered storms around in the afternoon (see the graphic above for information) in the local area, with a solid line of storms back to our west along the cold front itself. That front times its move through the region during the later evening hours -- likely after 7 PM or so -- and with diminishing daylight the potential for severe storms locally is a bit lower than it is to our west and northwest. That said, the line of storms with the front itself could produce some heavier downpours. At this point, the odds of heavy rain on a widespread scale or even on a scale similar to Labor Day seems low but some spots do stand a decent chance to pick up an inch or more of rain.